It was during the reign of HSH Prince Florestan, aided by his ever-diligent wife Princess Caroline, that the crisis over Menton and Roquebrune reached its height. The one royal figure on the other side of that crisis was HM King Carlo Alberto of Piedmont-Sardinia, head of the House of Savoy which held a partial protectorate over the Principality of Monaco since the Napoleonic Wars, including Menton and Roquebrune. When liberal outbursts began to sweep Europe, and the southern areas particularly, some royals tried to suppress the spread of such sentiments while others tried to get out in front of them. King Carlo Alberto tried to get out in front, perhaps belatedly, but quite successfully. It was a course of action that put him on a path to conflict with the Prince of Monaco. However, King Carlo Alberto was not quite the scheming man of ambition many of his enemies make him out to be. At the outset he was simply following the example seemingly being set by other monarchs and even the Holy Father in Rome. The difference was, having set out, he refused to change course. The two driving forces behind this movement were constitutional government and nationalism. This is the background. In 1846 His Holiness Pope Pius IX was elected to the Throne of St Peter and came with a reputation for being something of a liberal, a man known for the demands he had made for governments to care for their people and for his recognition of the people of the Italian peninsula as one nation. Naturally, liberals rejoiced when he was elected and further thrilled when he released from the prisons in Rome all of those jailed for sedition or revolution or any sort of what we would call political prisoners. He appointed progressives to positions of leadership and began the unheard of process of introducing constitutional government in the Papal States with a leadership made up entirely of laymen. King Carlo Alberto followed the example of the Pope and soon in the Principality of Monaco, particularly Menton, there were cheers for Pope Pius IX and King Carlo Alberto by those hoping for the same innovations to be handed down from their Prince. However, the Pope who was so celebrated by liberals and even Protestant governments eventually became horrified by the effects of his progressive changes and ultimately became known as one of the most ardently conservative or even reactionary of pontiffs. 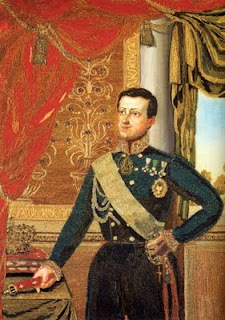 King Carlo Alberto, on the other hand, did not change course. His convictions may have even been strengthened by the sight of the Pope being forced to flee Rome in disguise and then brought back only by the intervention of the French army. The King of Piedmont-Sardinia would stay on the more liberal track and came to be hailed by Italian nationalists as the one monarch who never betrayed them. This meant clashes with other crowned heads, most significantly the Austrian Hapsburgs rather than the relatively powerless Prince of Monaco but it would also mean that, in the end, the House of Savoy would become the Royal Family of the unified Kingdom of Italy in the not too distant future. So, King Carlo Alberto enacted many liberal changes, including constitutional government, a system which hearkened back to the Code Napoleon but which also modeled itself somewhat on the constitutional monarchy of Great Britain which seemed to work quite well. New rights and liberties were granted and troublesome elements in Menton seized on this to demand the same in the Principality of Monaco. Many residents, even in Monaco itself as late as the 1940’s, continued to think of themselves as Italians in ethnic terms and the nationalist drive toward creating an Italian nation-state had its supporters in the Principality of Monaco. This put Prince Florestan in a terrible position. He was no reactionary himself and, indeed, Monaco would eventually put all the demanded changes into effect, but he did not want to see his country divided or taken over by a foreign power. The problem was that the power he most feared, Piedmont-Sardinia, was the only one he was supposed to appeal to for help. Charles Trenca, a leading liberal, was an early flashpoint. He had served the House of Grimaldi since 1819 and in 1841 he had been sent on a diplomatic mission to Turin along with the Duke of Valentinois (future Prince Charles III) and King Carlo Alberto had been impressed with him. On a subsequent mission the King chose him to act as go-between with the court in Monaco on the subject of annexing Monaco to Piedmont-Sardinia. Needless to say, Prince Florestan and Princess Caroline were less than impressed with this suggestion and Trenca was eventually dismissed for his plotting on behalf of Turin. King Carlo Alberto had showed his hand and his desire to include Monaco or at the least Menton and Roquebrune in his kingdom was now known. However, the agitation in those areas only increased even after reforms were made and Prince Florestan had no choice but to appeal to the King for Piedmontese troops to restore order. When soldiers were dispatched under General Claudio Gonnet to Menton they were met by a crowd of citizens carrying a large bust of their own beloved King Carlo Alberto. They could not bring themselves to shoot down a mob cheering their own monarch and when the crowd approached, carrying the bust before them, they simply saluted the image of their King and allowed them to pass at which point the crowd burst into cheers. General Gonnet declared that there was no trouble in Menton and marched his troops on to Monaco to report as much to the Prince. This did not go over well at the palace and they assumed, probably correctly, that General Gonnet was on the side of the protestors in wishing for annexation. When the Revolutions of 1848 swept Europe, Menton and Roquebrune declared their secession from Monaco as “Free Cities” when similar uprisings were breaking out across Italy. Within two years they would be formally placed under the protection of the Kingdom of Piedmont-Sardinia. However, King Carlo Alberto would not live to see that. 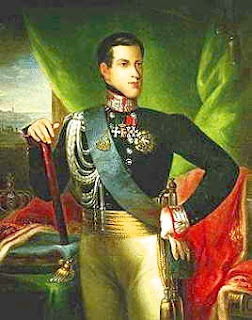 Following his defeat at the hands of the Austrians in the First Italian War for Independence, he abdicated in favor of his son, Vittorio Emanuele II, in 1849 and died later that same year. Piedmont-Sardinia would not hold the former Monegasque towns for long though. As we know, in 1860, as part of a treaty to gain French support for the unification of Italy by the House of Savoy, the County of Nice, with Menton and Roquebrune included, were ceded to the Second French Empire after a referendum, disputed by some as being less than honest. Nonetheless, aside from a brief period during World War II, Menton and Roquebrune have remained a part of France ever since then.